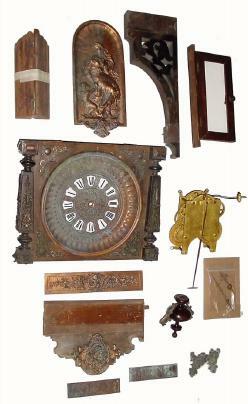 C.1890, Parts to an Ansonia "HANGING ANTIQUE", including the dial and front panel with all cast trim, the movement, including leader and hands, the central splat casting (tall alcove with lady), one side corbel, one side door, bottom splat and casting, center and side friezes and miscellaneous moldings. Except for one top finial, none of the top parts are there, no pendulum, chains nor weights. Still, when you figure a complete clock is worth $9000, there is a lot of raw material here for the handy craftsman, and you can check with Steve Sadowski for the casting that goes on the top.